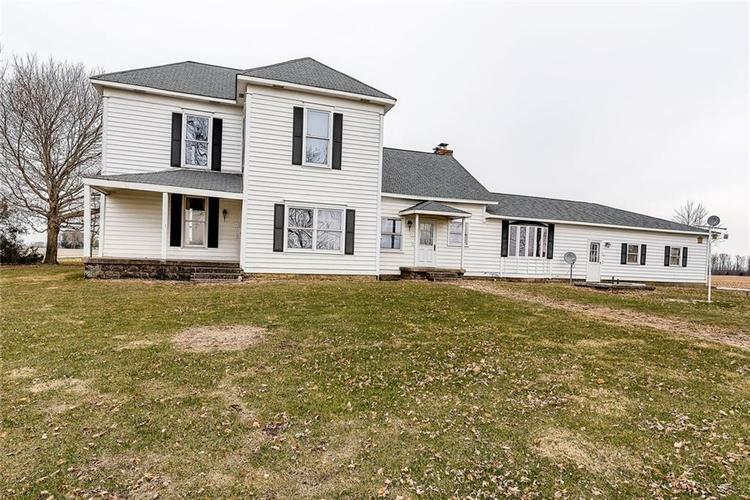 Steeped in age old tradition and style, this 4 bed/2 bath farmhouse is a country lover's retreat! Located on 2 peaceful acres and only minutes from New Palestine, ~30 min. to Monument Cir. Storied home is survivor of the '74, '86 tornadoes. Owners re-plumbed/re-wired home maintaining original charm including oak woodwork. HVAC updated since '06, Water Softener + Water Pump '18, 50 yr. roof '08. Country-size kitchen with center island. Siding and windows installed '99-'01. New paint on main. Upper bonus space + storage room off bath. Unfinished basement + extra-deep garage =storage options. Hand-hewn beams salvaged from nearby barn surround the glowing fireplace. Inspection, repairs completed! Take a shot, its potential makes it a slam dunk. Directions:From Indianapolis: 465 to 52 East for ~13 miles. Take a Right (South) at the red barn on 100 West where home is on Left.